Many studies support the link between marriage, good health, and mental wellbeing. Research has shown that married couples are more likely to survive cancer or a heart attack, less likely to suffer a stroke, and are often discharged from the hospital an average of two days earlier. Married couples are less likely to develop a mental illness or suffer from depression. Marriage seems to be equated roughly to the same benefits of a healthy diet or regular exercise. Why are married couples healthier? Generally, this is due to better social support and for practical reasons as well. A spouse is more likely to encourage healthier habits; and when done as a team, more likely to stick to these good habits. Emotionally, they are there for each other in times of stress or need for comfort and support. And practically, a spouse is often there during an emergency to call an ambulance or rush them to the hospital. Most married couples are covered by health insurance and less likely to engage in risky behavior. 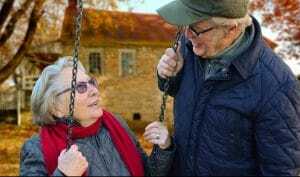 When you have another person looking out for you and your health, being married can even boost your chances of living a longer life. How can one’s health benefit if they are not married? Everyone can benefit from companionship whether married or not. Research has shown that non-married roommates have similar health advantages. And if you own a dog, cat, or other pet, you can enjoy some of the same health benefits as those who are married. Both married couples and pet owners have measured lower levels of cortisol, the stress hormone that can impair the immune system. Also, interacting with your spouse or cuddling with your pet releases oxytocin, often called the “love hormone,” that promotes a sense of calm. With several studies confirming the fact that companionship (either marriage, friends, family, or a pet) promotes good health, then it is easy to see why your parent living in an assisted living or memory care community would benefit when surrounded with compassionate caregivers, neighbors, good friends, and even a community dog. The social aspect of a community and support of 24/7 care staff help residents live a more active life with less stress while surrounded by new friends. How do assisted living and memory care communities encourage social interaction? Assisted living and memory care communities are built on a social model. In addition to offering exceptional care and support, Aegis Living provides a daily, rotating calendar of activities, clubs, excursions, lectures, exercise classes, and much more. These planned activities are great ways for our residents to build lasting relationships and quickly meet their neighbors. Life Enrichment Directors understand the benefits of friendships and encourage social interaction among residents. They cater activities to reflect the interests of the community, offering clubs and hobbies that their residents would enjoy. Many assisted living communities are also purpose-built to support the interests of our residents. Fully-stocked art rooms and workshops engage residents’ artistic and creative sides. Open rooms are used for exercise classes, music therapy, lectures, or entertainment. Some communities have demonstration kitchens to teach a new recipe or cooking techniques. Every community has specifically designed communal rooms, amenities, and programming to support their interests and encourage group interaction and companionship. How can the loss of a spouse affect your parent? Many residents are widowed. When someone who has enjoyed the health benefits, comradery, and love of a spouse, this loss can be devastating. Their health can even decline with the ill effects of being alone and lonely. Your widowed parent may feel very isolated which can lead to feelings of despair and depression. We all crave social interaction and connectivity. Friends and relationships can never replace the loss of a spouse, but they can add to your parent’s quality of life and help them heal. Moving your parent into an assisted living or memory care community can give them back that sense of belonging and restore a sense of hope after a loss. Creating new friendships through shared experiences and activities is a meaningful way to build strong bonds with their neighbors. From the minute your parent moves into an assisted living community like Aegis Living, they are encouraged to participate in activities and meet their neighbors. They are introduced to others in the community. Making a new friend can often help residents adjust more quickly to their new home. Community staff are very adept at nurturing new friendships among residents. Do married couples move into assisted living? Although it is more common for one parent or a single person to move into an assisted living community, married couples are accommodated as well. Often there are two-person apartments for couples. It is important that your parents are not only comfortable living in a community but also have their health care and support needs individually met. In some cases, families place one parent with dementia in memory care and the other parent in assisted living within the same campus. They are able to spend a lot of time together, share meals, and live together within the same community, but their unique needs are addressed accordingly. The bottom line is we can all benefit from companionship. If your parents are still married, cherish it. Understand that their relationship can make them both healthier, mentally stronger, and happier. But if they are single or widowed, there are ways to fill that void and add to their health other than marriage. And never overlook the power of a pet to bring comfort and promote good health. Learn more about the social benefits of an assisted living community by visiting your local Aegis Living.